George Clarke Ogle was born in Beeston in 1826, the first of ten children. By 1848 his parents were living at “Pentridge”; on Christmas Day, he married Ann Stanley of Ripley & in the 1861 census he was an Iron Turner living in Greenwich with 4 children. 1870 is said to be the year when GCO set up his business in the “Smithy”, an ex-chapel, demolished in 1909 to make way for the Electra theatre and now “The Foundry” – a nod to history? An obituary of GCOs eldest son, William, in 1936, says that originally Ogles and the Humber Cycle Company in Beeston were the principal producers of Penny Farthings. In 1881 Kelly’s trade directory gives the firm’s address as Perseverance Works, originally an old brewery but finally occupying what is now most of the council car park on Cromford Road. The first of many medals and trophies won over the years for their extensive patented farm machinery designs came in 1887 and in 1892 the firm had a stand at the Royal Show. 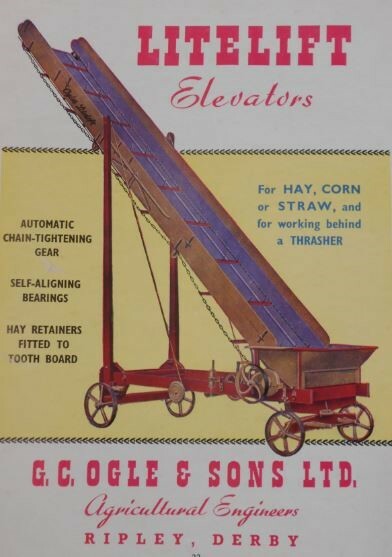 Arthur Robinson, a foreman who retired from Ogle’s in the early 1960s after 59 years said that when he started they made, as well as bicycles, milk floats and household mangles. In 1905 the firm became a limited company. Around 1916, William Ogle, having taken over the business after his father’s death in 1908, bought Horsley Park Farm & Castle Farm together with Castle quarry nearby; he was also a partner in the Mugginton Stone & Gravel Company. By 1920, the firm was producing the “Litelift” Elevator, probably what most Ripleyites of a certain age will remember seeing, somewhere between Cromford Road and the railway goods yard on Alfred Street. The independent firm of G C Ogle + Sons (Retail) Ltd. was registered and opened nearby on Victoria Road in the same year, for straight-forward sales to farmers. The year after William’s death in 1936, a new company was registered, Castle Quarry Ltd., to take over the quarry business; the directors were his 5 children . During WW2, Ogles worked for Rolls Royce; they were supplied with the machinery to make breech blocks for guns & artillery and also to recondition Merlin engines which were beyond aviation use, to power Motor Torpedo Boats. In 1961 the firm was put into Voluntary Liquidation due to competition from mass produced machinery. Fortunately, the different parts of the business were successfully sold off, the retail company unaffected. Kennings Remoulds acquired the site but now there is no reminder of either firm, unless the high brick walls round much of the council car park are relics of the old works. In the 1970s Ogles moved into hydraulics and high pressure pumps, used worldwide in the oil industry and for industrial cleaning & jetting, in which it continues to trade today.